The so called Chocolate Daisy of the great plains we love for the sweet chocolate scented yellow daisy flowers in summer. Forms a rosette of humble green leaves and then repeatedly in summer it sends up the wonderfully scented flowers on long stems to 1′ high. Full sun and well drained soil of average to rich fertility. Regular summer water encourages more bloom but it takes dry conditions when established. Rock gardens, gravel gardens, borders, containers. To 18″ wide when happy. Full all day sun. Lifespan: 3-5 years in our experience in Oregon. 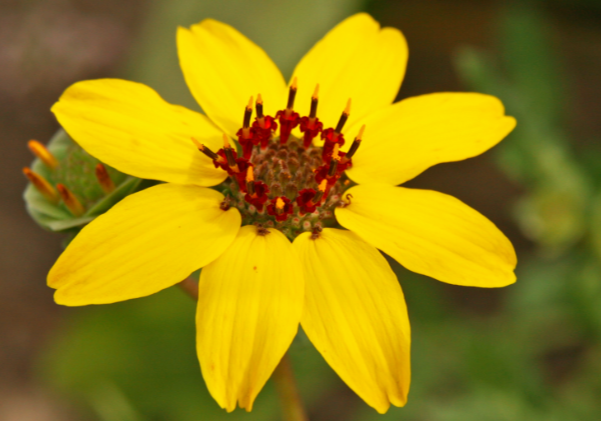 The yellow petals surround a soft green center- makes a nice scented cut flower.